You are here: Home Articles Pirelli Glass Ltd.
Pirelli Glass Ltd. are best known for their involvement with Vasart and Strathearn as well as for their sets of Guinness animals, However, they also manufactured a range of lamp work animals. All of the labels found are shown together in the article. Pirelli also did a lot of transfer decoration work on bought-in glassware - some of this work was given to Vasart too. 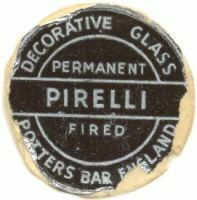 Pirelli Glass Ltd. were based in Potters Bar, just north of London, UK. The company was launched in 1945 by Robert George Dunlop, known as George, scientific glassmaker, to make glass giftware and lampwork animals. He first made contact with the Ysart’s in about 1949, as he wanted to sell their paperweights and also to commission them to make pieces for him. He later helped Vincent Ysart to set up Vasart Glass Limited and replaced the acid etched signatures with a paper label. Pieces sold by Pirelli, had a label that was virtually identical label to that used by Vasart (see below). It is possible that Pirelli used their versions of the labels earlier than Vasart but I think it unlikely while Salvador was alive. George Dunlop was also involved with Strathearn Glass Limited. 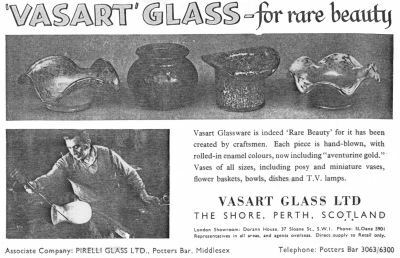 An advert for Vasart Glass appeared in the “Pottery Gazette and Glass Trade Review”, June 1957, page 758. The half-page advert shows four small bowls and a photo of Vincent working on a vase. It mentions Pirelli Glass Limited as well as a London showroom at Dorann House, 37 Sloane Street, London SW1. I presume that the showroom belonged to Pirelli Glass or an associated company. The tenants should be traceable to verify this. Company documents show that other directors were George Dunlop’s wife and son, and a John Henry Hollingdale — seemingly a small family business. But the papers show that Pirelli Glass Ltd. was a subsidiary of Hertford China and Glass Industries Limited of which George Dunlop and J H Hollingdale were also directors, along with others. There was a web of companies and from the papers it would appear that some of these were used for manipulating monies, a quite common activity with English companies. Mortgages were spread between the companies, and because the papers are incomplete or faded beyond readability it is not easy to tell what exactly went on. The company listed its activities as “the manufacture and distribution of glassware, pottery and fancy goods”. When the Pirelli Glass company was liquidated in 1985 the liquidators described the business as “wholesalers and retailers of glass and china”. Pirelli was wound up in 1983, but objections raised by creditors caused the delayed liquidation. I did manage to contact close relatives, but they were quite unwilling to discuss anything about the businesses; from what was said, I gather it was a very messy end. By 1968, Brian J. Dunlop had replaced his father as Managing Director and by submissions to Company House (Where UK companies have to submit there official filings), appeared to be running things more correctly. In 1969, on a turnover of £183,211, profits of £10,244 were reported; but by 1971 an increased turnover of £208,797, including £8,876 exports, resulted in a loss of £9,881. It is likely that Pirelli did manufacture the reported lampworked animals when they started and switched to being a reseller only later. Early records reveal the following glassworkers in 1948: Edward Robbins, Edward H C Maugham, and William Michael Dunlop who was listed as a glassmaker, jig and pattern maker. Pirelli owned property at 3 Oakmore Lane, Potters Bar, Herts. This may have been the subject of mortgages which referred to land at the rear of (unreadable), Potters Bar. The company was listed at 25 Dove Lane, Potters Bar in 1947 and in 1971 at 7 Kentish Lane, Brookmans Park. A company set up in Scotland, Pirelli Glass (Scotland) Limited, of 4 West Regent St, Glasgow, appears never to have been used and got struck off in 1979. This company also had R. George Dunlop, J. H. Hollingdale and B. J. Dunlop listed as directors. Additional directors were Graham R. Wurzel and Charles Caplin; the latter was also a director of Hertford China and Glass Industries Limited. Other relevant companies in the papers were: Oakmere Glass Limited a wholly owned subsidiary of Pirelli Glass Limited and Lattacino Limited. I have not found out anything about Lattacino Ltd., nor the holding company: Hertford China and Glass Industries Limited. Oakmere Glass Limited were sole agents for the Babycham Glasses that were decorated at Vasart Glass Limited in Scotland and Nazeing Glass in Essex. Some additional data for anyone wanting to further this research: R. George Dunlop, Joan Dunlop (Company Secretary) and Brian John Dunlop were known to live at 67 Stratford Gate, Potters Bar and J. H. Hollingdale at 43 Stratford Gate, Potters Bar. See another article on Pirelli Glass by Angela Bowey in the Glass Encyclopaedia. Advert, Vasart Glass Ltd. Pottery Gazette and Glass Trade Review - June 1957, page 758. Advert, Pirelli Glass Ltd. Pottery and Glass - April 1958, page xxxvi. Advert, Pirelli Glass Ltd. Pottery and Glass - September 1959, page 596. Advert, Oakmere Glass Ltd. Pottery and Glass - September 1959, page 596. Advert, Pirelli Glass Ltd. Pottery and Glass - March 1960, page 136. 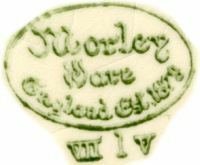 Circular label seen on Morley Ware earthenware mug and decorated glassware. According to Godden the pottery mark was for August 1944 which implies the Pirelli label was the earliest in use. Pirelli label found on lampwork animals. Pirelli label found on Vasart & Strathearn ware and weights. Note “Hand Made in Scotland”. Vasart’s own label is the same design, coming into use in 1956 when Dunlop joined Vincent Ysart and set up Vasart Glass Ltd.